Announcing the official recipe for the August Baking Challenge! Recipe tips, customization ideas, and rules for how to participate in the challenge for a chance to win the prize are all detailed below. Oh boy, the August baking challenge was a tough one to decide on!! I put up a poll in the Facebook community and on my Instagram story asking you guys what you wanted to bake for August. It was a SUPER tight race between yeast-risen baked doughnuts and mini cheesecakes. Interestingly, the doughnuts won on Facebook and the cheesecakes won on Instagram. I made the final executive decision to go with…. NO BAKE MINI CHEESECAKES! Second, September’s baking challenge is going to be all about yeast baking with a super easy and simple recipe and tons of tips. Since I know baking with yeast can be super intimidating, I wanted to wait until we nail that challenge before doing a bunch more yeast baking. 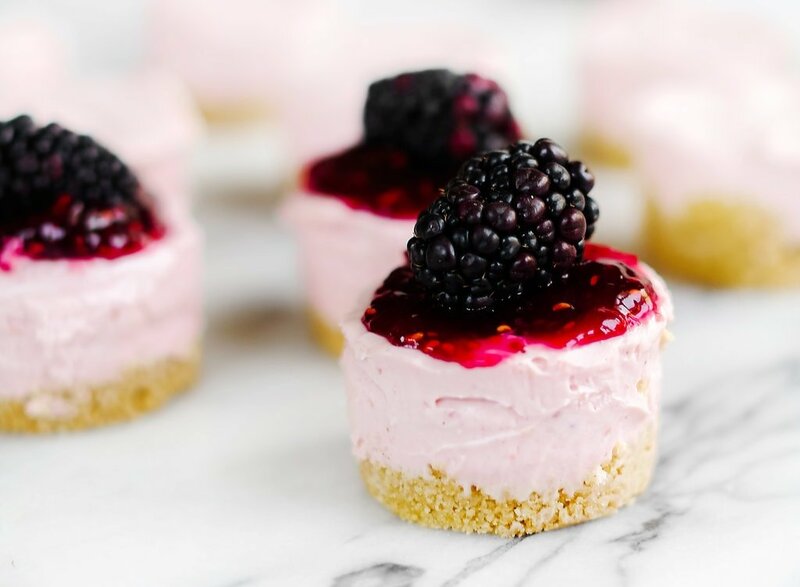 Since we’re still enjoying beautiful fresh summer fruit through August, I’ve selected my No Bake Mini Blackberry Cheesecakes as the official challenge recipe. Especially since blackberries should be super fresh right now! If you’d prefer to use a different berry then feel free to do so! It’s super easy to switch in the recipe. 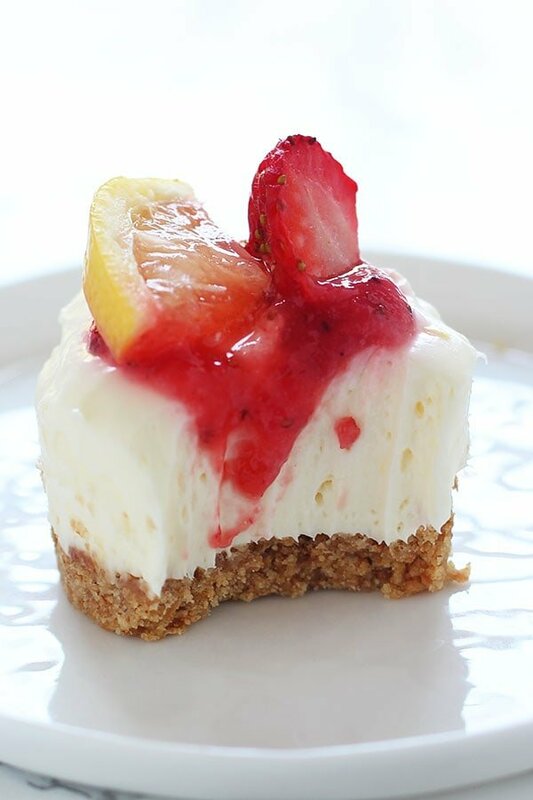 OR, you could also follow my recipe for No Bake Mini Strawberry Lemonade Cheesecakes. Have fun with fresh summery flavor ideas! But wait! I don’t have a mini cheesecake pan! Use a standard size 12-cavity muffin tin instead. Just be sure to line it with paper or foil liners and spray the liners with nonstick cooking spray, otherwise the graham cracker crust might crumble and the cheesecake might stick when you go to remove them. I *don’t* like to use a mini muffin tin here because I think the cavities are just too small and shallow. You can also use mason jars or any other small glass container to make individual or shareable cheesecakes! This would be a beautiful presentation for a dinner party or BBQ. I think these mini mason jars are super adorable. Whatever you do, feel free to get creative! Read this over if you have any questions! The recipe uses a simple graham cracker crust made with finely ground crackers and a generous amount of butter to ensure the crust holds its shape since there’s no baking here. To make quick and easy work of assembling the crust, I like to take a heaping tablespoon of the graham cracker mixture and place it into each cavity. Then I take a shot glass or small tamper and to firmly press the crust down into the pan so it’s nice and compact and neat. That’s important so the cheesecakes have a sturdy base. If there are a lot of stray crumbs up the sides of the cavities I’ll try to brush them away so they don’t end up on the actual cheesecake. Make sure your bricks of full-fat cream cheese are completely at room temperature so you get a smooth texture. Don’t use cream cheese for spreading on bagels. Since there are no eggs in this recipe and we aren’t baking it, there’s no risk of overmixing the batter. That means you can beat it to oblivion to make sure it’s completely smooth and creamy with no lumps. You can also fill each cavity with cheesecake filling all the way to the top, again because there’s no risk of it overflowing while baking. Make sure you chill the cheesecakes for AT LEAST 4 hours, or until firm enough to hold their shape. This may take more time depending on your fridge and the weather, so I usually just chill overnight to ensure they’re firmed. Since this is a no-bake recipe, the cheesecakes will be a little less solid. That’s okay. As long as they look something like these pictures you should be good to go! If you’re serving them for a potluck or BBQ, try to keep them refrigerated until soon before serving. If that’s not possible, then freeze them for a few hours before placing out on the table if you know they’ll have to sit there a while. The plain cheesecakes, without the topping or garnishes, can be stored in the fridge in an airtight container up to 2 days ahead of time. Step 1: Make a batch of my Mini No Bake Cheesecakes. Share your photo inside my private Handle the Heat Facebook community. If you’re not already inside, click here to request access. You can submit to one or the other, or to BOTH for two entries. Every person who submits a photo following those directions will be entered into a random giveaway to win one $75 Amazon gift card! No purchase necessary. This is open to anyone in the world who can use Amazon, I will purchase a digital gift card from your country’s Amazon website. The winner will be selected randomly; so don’t worry about taking a perfect picture. Your photos may be put on display to share with my entire audience – that’s hundreds of thousands of people! By the way, last month’s Best Every Chewy Brownie challenge was our best challenge yet! SO many of you baked up your brownies (I saw lots of double batches being made – yum!) and shared photos on Instagram or my private Facebook community. I’ll be randomly selecting and messaging July’s winner this week, so keep an eye out! Would the no bake s’mores cheesecakes count for the challenge? Who won the August Baking Challenge?